BEIRUT: Former Prime Minister Fouad Siniora denounced Tuesday the seizing of a group of nuns earlier this month in Syria and called for their immediate release. Meanwhile, a source from the General Security told The Daily Star that Maj. Gen. Abbas Ibrahim is in contact with Qatari officials as part of efforts to secure the release of the 13 nuns. “We denounce assaults against religious sites,” Siniora, who headed a delegation of Future Movement MPs, told reporters after meeting with Beirut Greek Orthodox Metropolitan Bishop Elias Aoudeh. “The attacks were not only limited to religious sites but they also targeted people who exist only to serve humanity such as the kidnapping of the two dear bishops [Paul Yazigi and Yohanna Ibrahim] and the nuns,” he said. “We hope that anyone able to help will exert efforts to release the nuns and bishops because keeping them in captivity does not serve the Syrian cause and doesn’t help overthrow the oppressing regime in Syria but leads to more violence,” he added. Ibrahim, who heads Lebanon’s General Security, paid a visit to Qatar over the weekend, seeking the Arab state’s assistance in the case of the nuns seized earlier this month in Syria. The source, who spoke on condition of anonymity, said that Ibrahim may visit Qatar once again if it was deemed necessary. Last week, 13 nuns were taken by Syrian rebels from their convent in the historic Syrian town of Maaloula. They appeared in video footage last week and said fierce shelling and bombardment had forced them to depart their convent. In April, armed men kidnapped Aleppo’s Greek Orthodox Archbishop Paul Yazigi and Syriac Orthodox Archbishop Yohanna Ibrahim while the two were traveling to Aleppo from the Turkish border. Efforts have been ongoing to secure their release. In October, mediation by Doha helped secure the release of a group of Lebanese pilgrims kidnapped a year earlier in Aleppo, northern Syria. 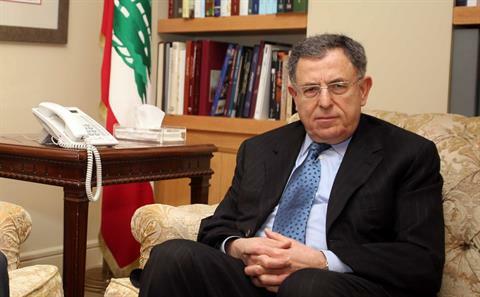 Siniora, turning to the crisis over forming the next government, reiterated the need for a neutral Cabinet that excludes political groups to help Lebanon confront the challenges facing it. “Many issues require the presence of an effective government; President Michel Sleiman and Prime Minister-designate Tammam Salam should form a government capable of dealing with the current situation in Lebanon,” Siniora, who heads the Future parliamentary bloc, said.